An otherwise magical winter getaway in Stockholm can face one challenge – cold-weather dressing is not easy. It can get especially tricky when you’re trying to balance staying warm and keeping up with the Scandinavian street style set. However, we have enough inspiration to keep you snug and stylish with our fashionable winter guide, so you can discover the Swedish capital’s cosiest and ‘coolest’ spots with ease. 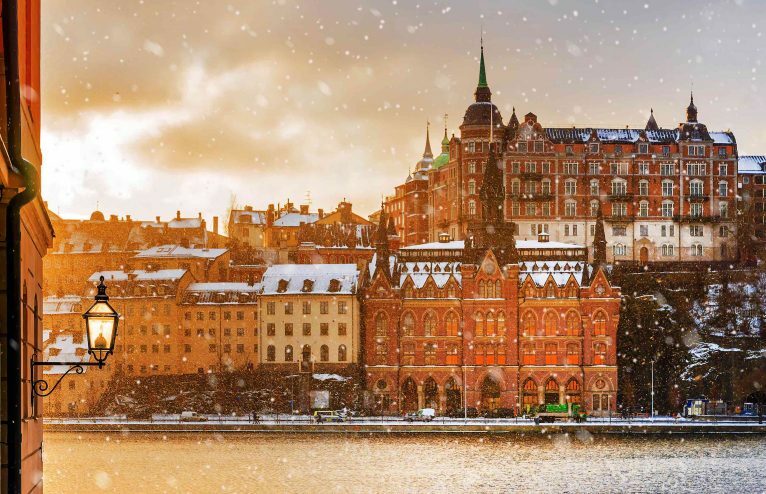 During the summer months, iconic Stockholm establishments such as the Grand Hôtel and Hotel Diplomat are particularly appealing due to their proximity to the waterfront, however, in winter it may be more atmospheric to stay in one these chic alternatives instead. Hailing from Scandinavia myself, I naturally have a soft spot for Nordic cuisine and even though there are numerous amazing open-air dining spots to choose from in Stockholm and its surrounding archipelago during the summer months, eating out in the winter time can be just as delightful. I always try and seek out labels and designers that are local to the country or region, and Stockholm is a real treasure trove of Nordic labels and their respective flagship stores. Cool-girl brands like Samsøe & Samsøe, Rodebjer, Eytys and Dagmar all have stand-alone stores here, and more cult labels like style influencer Elin Kling’s Totême as well as accessories brand ATP Atelier can be found in major department stores such as Åhlens and Nordiska Kompaniet. Many of these Swedish and Nordic labels hit the spot for shoppers craving ‘affordable luxury’. Speaking of affordable (or at least more affordable), the Acne Archiv store has a selection of the Swedish label’s cult denim, leather jackets and shearlings at reduced prices. If you have room left in your Rimowa for some Scandinavian design, you can get your fix at legendary homewear store Svenskt Tenn. Stunning art-deco pieces from lamp shades to cabinets, designed by Josef Frank, are every bit as posh as the Royal Warrant the store earned in 1928 from the Swedish Royal Family. Remember to wrap up warm when hitting the shops in wintery Stockholm, even though most of the fashionable stores are conveniently within close proximity of each other in the Norrmalm and Östermalm districts. For Isabella’s guide to London’s best shopping, take a look here and to follow her on Instagram, click here.